The sky has been clear but transparency has deteriorated since Sunday night. The Milky Way is noticeably less brilliant but all the stars of the Little Dipper are easily visible. We've enjoyed some casual visual star gazing and trying out the little Celestron FirstScope. The FirstScope gives some great views for a $50 telescope with an upgraded 25mm Plossl eyepiece. 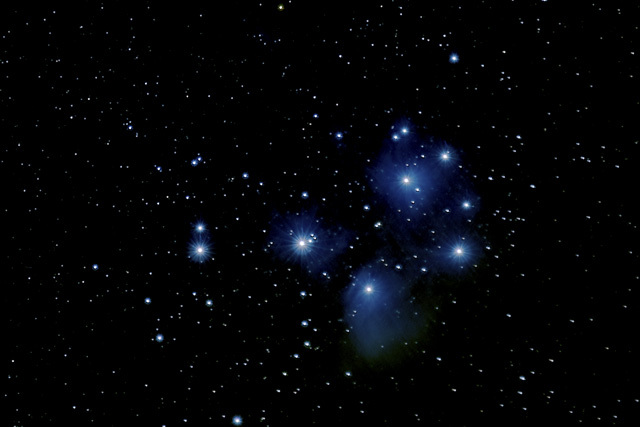 I decided to image the Pleiades even though they were low in the west. This is the result of 76 minutes of exposure before we lost it behind a creosote bush. Sony a6300 with a vintage Nikkor 180mm ED lens and UV/IR cut filter. Exposed f/4, ISO 400, for 30 sec each. 76 minutes total exposure time. All 152 frames quickly stacked in Nebulosity, with stretching, white balance, and final crop in Photoshop. Taken 2019-04-04 03:39-05:09 UT from Terlingua, Texas. We are headed to Boquillas, Mexico later today. If the border closes we may have to swim back.